Dinny Nolan comes from the region of Papunya in the Northern Territory. Dinny was born circa between 1922 and 1926 west of Mount Allan (near Yuendumu). Dinny belongs to the language group Warlpiri / Anmatyerre. 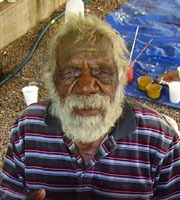 He worked as a stockman on many of the cattle stations in the Northern Territory and settled in Papunya in the 1970’s. Dinny Nolan is a senior lawman and a recognised leader for Rainmaking and Water Dreaming ceremonies. Dinny joined other artists at Papunya, his older brother, Kaapa Tjampitjinpa, and his tow cousins, Billy Stockman Tjapaltjarri and Clifford Possum Tjapaltjarri, were also members of this group of artists. Nolan’s art is characterised by his predominant use of natural ochre colours, and the designs he uses are the same he paints on the bodies of men taking part in ceremonies. One of Dinny Nolan’s designs was used for a stained glass window in the National Gallery of Victoria. Dinny Nolan is one of few survivors of the last officially condoned massacres which occurred on Coniston Station in August 1928. Selected Collections: National A Gallery of Australia, Canberra; National Gallery of Victoria, Melbourne; Art Gallery of South Australia, Adelaide; Art Gallery of Western Australia, Perth; University of Western Australia, Adelaide; Art Gallery of Western Arts Centre, Alice Springs; Holmes a Court; Artbank. Selected Exhibitions: 1977 Realities Gallery, Melbourne; 1983 "Recent Australian Paintings: A Survey 1970-1983"; 1988 "Yuendumu and Beyond", Melbourne; 1988 Wagga Wagga City Art Gallery, Artist-in-residence (with maxie Tjampitjinpa); 1989 Westpac Gallery, Melbourne; 1989 Lauraine Diggins Fine Art, Melbourne; 2000, 2002 Araluen Arts Centre, Alice Springs. Commissions: 1981 construction of a sand painting (with Paddy Carroll Tjungurrayi), Sydney. Source Includes: Aboriginal Artists, dictionary of biographies by Janusz B. Kreczmanski and Margo Birnberg (This illustrated dictionary of 446 pages showing many photographs of artists and paintings is available from Doongal).